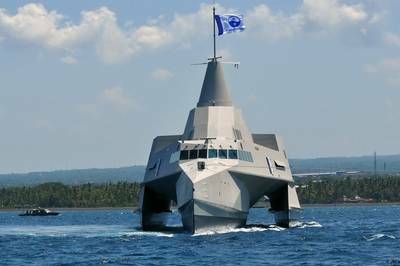 Indonesia's North Sea Boats Ltd launch one of the most innovative warships in the world. Measuring 63m in overall length, the vessel will be named KRI Klewang - after a traditional Indonesian single edged sword. It combines a number of existing advanced technologies into a single, unique platform; a wave-piercer trimaran hull form, constructed exclusively of infused vinylester carbon fibre cored sandwich materials for all structural elements, with external “Stealth” geometry and features intended to reduce detection. 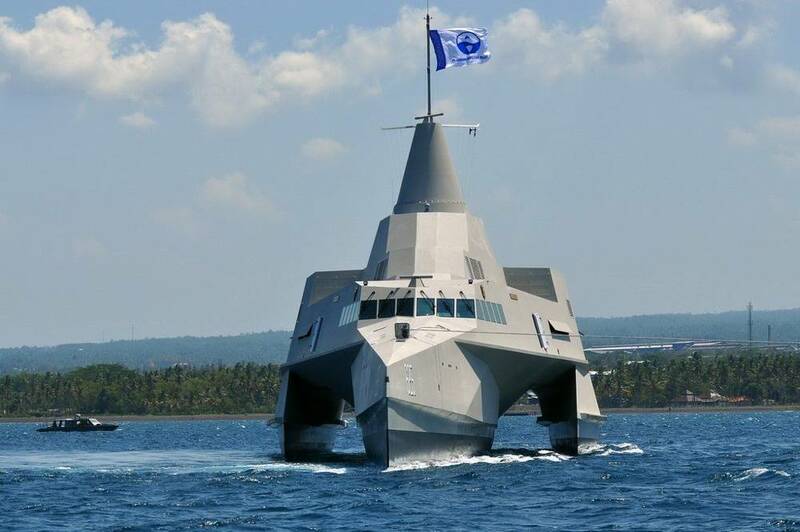 The result of a 24 month research, design and development collaboration with New Zealand naval architects, LOMOcean Design Ltd, the ship represents a significant step forward in the use of advanced warship building technologies in countries outside of Europe and the United States. Offering stability and shallow draft, the vessel is designed for patrolling the littorals. The hull shape is intended to permit high speeds to be maintained and thus maximize crew operational capability in the short, steep seas characteristic of the coastline around the Indonesian Archipelago. The design borrows elements from previous trimarans from the same designer, including the 24m Earthrace (later Ady Gil), holder of the record for the fastest circumnavigation of the globe by a power boat. The design borrows elements from previous trimarans from the same designer, including the 24m Earthrace (later Ady Gil), holder of the record for the fastest circumnavigation of the globe by a power boat. The underwater sections have been optimized for extended range at fast patrol speeds; the length, transverse and longitudinal positions and immersion of each of the three hulls have been carefully tailored for least resistance using both slender body analysis and towing tank testing. The underwater sections have been optimized for extended range at fast patrol speeds; the length, transverse and longitudinal positions and immersion of each of the three hulls have been carefully tailored for least resistance using both slender body analysis and towing tank testing. Powering and propulsion is by multiple MAN V12 diesel engines, coupled to MJP 550 water jets, located in both the centre hull and each of the two side hulls for maximum propulsive thrust and manoeuverability. The use of carbon foam sandwich composites on this scale in naval application is unprecedented outside of Scandinavia and is representative of the current state of the art in both maritime composites structural engineering and production technology. The structural design was subject to third party approval by Germanischer Lloyd in Hamburg, using design and approval methodologies tailored specifically for the unusual geometry of a large, wave-piercing trimaran.